“We extend our heartiest congrats to Buffie and her caregivers at RBARI, as well as the other shelters who helped us continue our mission to put pets first in this year’s Tournament of Tails,” said Petplan co-CEO Natasha Ashton. 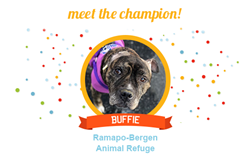 It’s the Year of the Dog, and canines continue their reign as Buffie from Ramapo-Bergen Animal Refuge (RBARI) in Oakland, NJ is crowned champion in the fifth annual Petplan pet insurance Tournament of Tails. The bracket-inspired online tournament features 32 dogs and cats competing for their shelters in friendly “nose-to-nose” matchups. Between March 12 and April 4, animal lovers across the United States cast over 205,000 votes to help propel their pet picks to the next round. And after a close matchup between runner-up Jammers, a feisty feline from Wayside Waifs in Kansas City, MO, Buffie scored the top-dog position for the win. As a result, she’ll be taking home the $5,000 grand prize on behalf of RBARI. The donations and development resources for Tournament of Tails come via Petplanthropy, Petplan’s official philanthropic initiative. Buffie’s journey to the tournament had its challenges. Because of long-term neglect, she was found with a hematoma on one ear and scarring from painful ear infections that blocked her ear canals. Her right ear needed to be amputated, and she required bilateral ear ablation to create new ear canals — but it hasn't affected this superstar one bit. She’s a kind soul who loves everyone she meets, especially children. Buffie’s spirit continues to shine as she celebrates her big win while continuing to keep her focus on the ultimate prize: finding her forever home. To sniff out more information, visit the Tournament of Tails website at gopetplan.com/tournament-of-tails. Petplan policies are underwritten in the United States by AGCS Marine Insurance Company, a member of the Allianz Group (rated A+ A.M. Best), and XL Specialty Insurance Company; and in Canada by XL Specialty Insurance Company - Canadian Branch. XL Specialty Insurance Company is rated A+ by S&P (2018). Coverage may not be available in all jurisdictions. For more information about Petplan pet insurance, visit http://www.petplan.com or call 1-866-467-3875.